Blue chip stocks are popular stocks to buy because they represent stable companies that often pay attractive dividends. There is no official definition for a blue chip stock, but in general they are large, stable, and financially sound companies that are leaders in their respective industries. These companies are often household names, have long track records of dependable earnings, and dominate their industry with a large market share. As a result of their fundamental strength, blue chip stocks are also popular stocks to buy. Here's why. Blue chip stocks are typically stable companies. While blue chip stocks may not be growing as fast as the hottest start up coming out of Silicon Valley, their stability and staying power is an attractive draw for investors of all stripes. These companies have often led their industries for decades, if not longer. They've thrived in boom times and emerged stronger from the tough times. Their products are recognized and valued by the customers they serve. The advantages of being a blue chip stock are also reflected in their financial statements. Blue chips often have better profit margins than their competitors, a result of strong branding, pricing power, and economies of scale. Their balance sheets are usually gigantic and well-managed as well, giving them access to low-cost capital from the bond market and other sources. Blue chip stocks are usually included on the most popular stock indices, like the Dow Jones Industrial Average. Blue chip stocks are popular stocks to buy for dividends. Blue chip stocks typically pay attractive dividends, a consequence of their financial strength and stability. A consistent dividend is a powerful force over the long term if those dividends are reinvested. For example, the average dividend yield of the 30 blue chip stocks on the Dow Jones Industrial Average is 2.59% as of June 16, 2016. That yield is better than the broader S&P 500's average yield of 2.16% and the smaller cap Russell 2000's 1.55% yields. 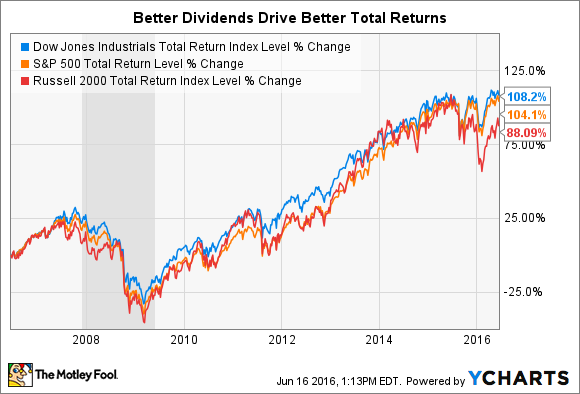 Over time, higher dividends can translate into a big boost for returns. Using the three indices again, the chart below shows that over the past 10 years, the Dow has outperformed both the S&P 500 and Russell 2000 on a total return basis. Total returns take into account stock price appreciation plus reinvested dividends. 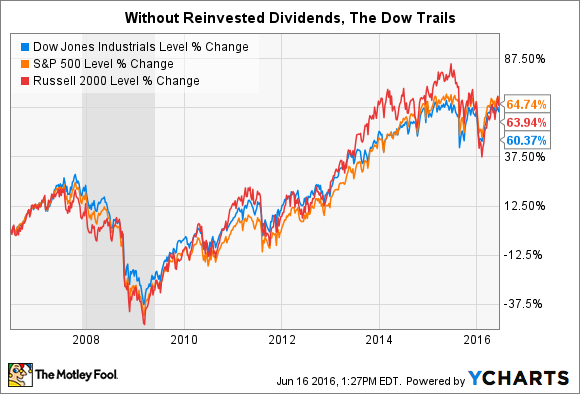 Excluding reinvested dividends, the Dow's stock price appreciation alone trails both the other indices over this same time period. The Dow's level is up 60.3% over the past 10 years, trailing the 64.7% and 64% gains in the S&P and Russell, respectively. It's no coincidence that the total returns, which take into account stock price appreciation plus reinvested dividends, coincide with the relative dividend yields of each index. Can't decide on one blue chip stock? Buy a blue chip ETF. Despite their size, age, and stability, there is no guarantee that an individual blue chip stock will continue its dominance in the future. The financial crisis and great recession in 2008 and 2009 led to the bankruptcy of several established blue chips, and nearly bankrupted many more. To truly take advantage of a blue chip stock's long term potential, it makes sense to diversify your holdings to a basket of blue chips. By diversifying, you protect yourself from the risk of a single company falling on hard times by also investing in other blue chips in different industries. One of the easiest ways to accomplish this is by investing in a low-fee blue chip ETF. There are numerous options in the ETF world to increase your blue chip exposure, from a fund that directly tracks the Dow or another large cap index, to more targeted funds that target Dow stocks with attractive dividends, large companies in any given sector, or large cap stocks with historically low volatility. There are even ETF's available that focus on growth, value, and other investing strategies within the world of blue chip stocks. Whether you're looking to diversify your blue chip portfolio or just want an easy way to add large cap exposure, a low-fee, blue chip ETF is a great option.